For my Daughters and their Mom…by special request. This is my mom’s famous (among family and friends) Sweet Potato Casserole. The recipe is in her words. Of note: The sweet potatoes are first brought to a boil in plain water, then simmered until quite tender . She usually peel them after cooking when they had cooled enough to handle. The butter in the potato mixture was pre- melted. Also for the topping, She usually used pecans. The butter was melted first in a 10” cast iron skillet, then the nuts, brown sugar, and flour were stirred in until well melted and mixed. Melt butter, add the above and mix well. Spread over sweet potatoes. Bake at 350° 25 – 30 minutes until bubbly around the edges. 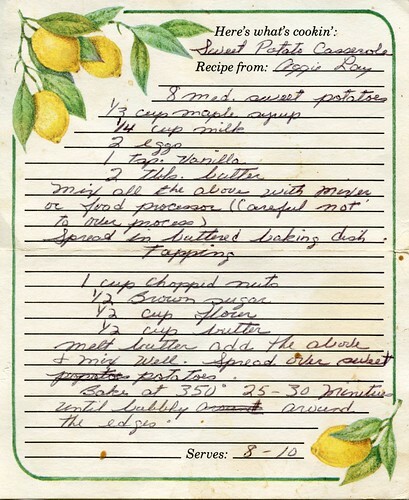 This entry was posted in Sides and tagged casserole, Grandma's, recipe, Recipes, sweet potato, thanksgiving. Bookmark the permalink.